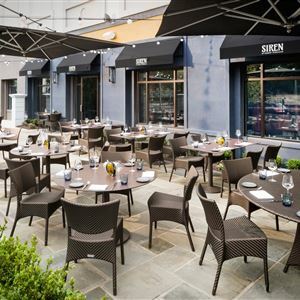 Property Location With a stay at The Darcy Washington DC, Curio Collection by Hilton, you'll be centrally located in Washington, convenient to Dupont Circle and White House. This 4-star hotel is close to George Washington University and Ford's Theater. Rooms Make yourself at home in one of the 226 air-conditioned rooms featuring MP3 docking stations and LCD televisions. Wireless Internet access (surcharge) keeps you connected, and digital programming is available for your entertainment. Bathrooms have complimentary toiletries and hair dryers. Conveniences include phones, as well as laptop-compatible safes and desks. Amenities Enjoy recreation amenities such as a fitness center or take in the view from a terrace. Additional amenities at this hotel include wireless Internet access (surcharge) and concierge services. Dining Enjoy a meal at one of the hotel's dining establishments, which include 2 restaurants and a coffee shop/café. From your room, you can also access 24-hour room service. Quench your thirst with your favorite drink at a bar/lounge. Breakfast is available for a fee. Business, Other Amenities Featured amenities include complimentary newspapers in the lobby, dry cleaning/laundry services, and luggage storage. 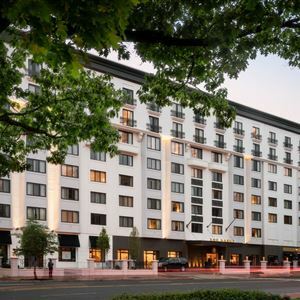 With a stay at The Darcy Washington DC, Curio Collection by Hilton, you'll be centrally located in Washington, convenient to Dupont Circle and White House. This 4-star hotel is close to George Washington University and Ford's Theater. Make yourself at home in one of the 226 air-conditioned rooms featuring MP3 docking stations and LCD televisions. Wireless Internet access (surcharge) keeps you connected, and digital programming is available for your entertainment. Bathrooms have complimentary toiletries and hair dryers. Conveniences include phones, as well as laptop-compatible safes and desks. Enjoy recreation amenities such as a fitness center or take in the view from a terrace. Additional amenities at this hotel include wireless Internet access (surcharge) and concierge services.